This charming classic, newly renovated in 2011, looks like a Port Clyde Village cottage on the outside, but Lone Maple is high-end on the inside. The result is a perfect blend of timeless Maine architecture and modern necessities. Located in a small cluster of houses atop a hill overlooking Port Clyde Harbor, Lone Maple is just a 10 minute walk into the village. 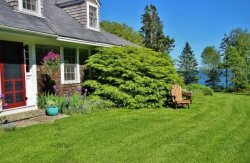 The cottage overlooks a large lawn and from almost any window you can see the harbor water traffic, including the ferry/mailboat to Monhegan Island, go about its business all day long. The stunningly gorgeous Marshall Point Lighthouse is another 15 minute walk and guests can walk to almost anything — from the general store to the post office to dinner on the pier. The cottage is perfectly suited for 2 people — on the second floor find a half bath and a bedroom. The bedroom has an ample closet, a queen bed and is situated in the peak of the cottage. Three skylights (outfitted with electronic shades) and a large double-hung window let in sun, the stars and a fabulous breeze off the water. The half bath has a skylight as well (also with an electronic shade). Downstairs, at the front of the cottage, you'll find a comfortable living room and the dining area — complete with 4 chairs. The living room includes a couch, chair, and a wall-mounted flat-screen television with cable. The cottage is also outfitted with wireless Internet connection. Downstairs you will also find the shower — this larger-size stall shower is hidden behind a door — and a large folding screen gives you ample privacy. Each and every window has light-filtering privacy blinds as well. Outside, find a small deck off the kitchen and a basic gas grill. There are two Adirondak chairs at the front of the cottage, overlooking the water. The neighborhood is friendly, the location ideal and the accommodations comfortable. Fans and ocean breezes are provided!